View More In Health Care. 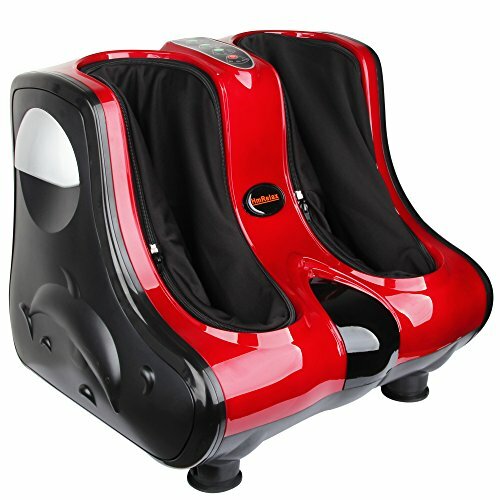 Multifunctional massager features with shiatsu massage, kneading massage, rolling, vibration and heating function. It can provide 360 degree all cover massage. The massager can also make you leg beautiful if using it often. Ergonomically design targets the sensitive points of calf region and soles of feet the reflecting characters of the complicated nerve system. Infrared physical therapy that can improve metabolism and blood circulation. Automatic massage program provides kneading, rolling, vibration & massaging combinations to give reflexology therapies to different human's organs. Pressure nodes located under the soles of your feet stimulate the vital reflexology pressure points. Improves blood circulation. For custom working options, foot massage and calf massage can work independently. You can choose either one or both of them. 3 modes of foot massage and 3 intensity of calf massage can be chosen. Operates it by handy touch-panel control on the unit or a remote control. Available in a Velour, New MicroSuede Fabric. The detachable fabric foot covers for easy cleaning. 110V 60 Hz. Power assumption: 80 watts. UL listed. One year warranty. If you have any questions about this product by HmRelax, contact us by completing and submitting the form below. If you are looking for a specif part number, please include it with your message.